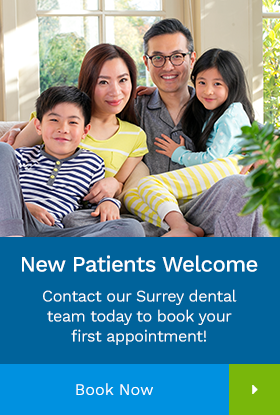 We offer dental x-rays at Elgin Corners Dental in Surrey. Dental radiographs (x-rays) are essential, preventative, diagnostic tools that provide valuable information not visible during a regular dental exam. Digital x-rays reduce radiation 80-90% compared to the already low exposure of traditional dental x-rays. The amount of radiation exposure from a full mouth series of x-rays is equal to the amount a person receives in a single day from natural sources. Dental x-rays produce a low level of radiation and are considered safe. Dentists take necessary precautions to limit the patient’s exposure to radiation when taking dental x-rays. These precautions include using lead apron shields to protect the body and using modern, fast film that cuts down the exposure time of each x-ray. A full mouth series of dental x-rays is recommended for new patients. A full series is usually good for three to five years. Bite-wing x-rays are taken at check-up visits and are recommended once or twice a year to detect new dental problems.